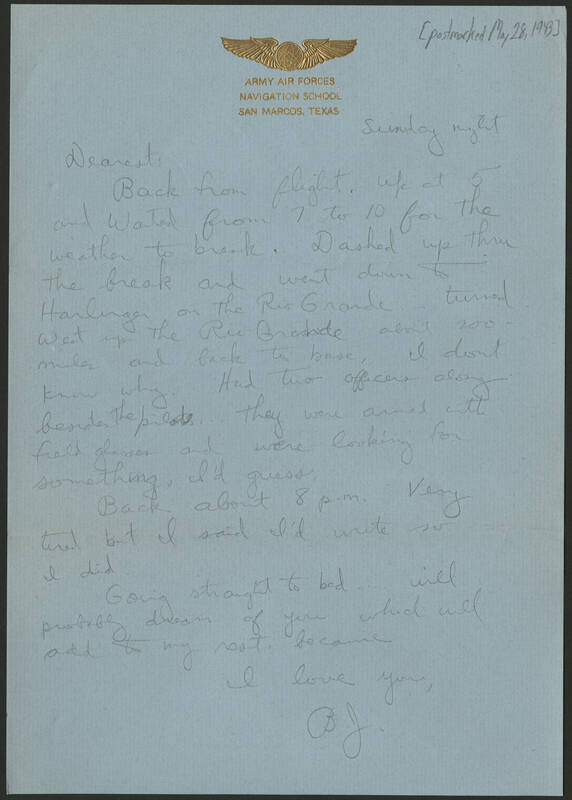 [postmarked May 28, 1943] Sunday night Dearest: Back from the flight. Up at 5 and waited from 7 to 10 for the weather to break. Dashed up thru the break and went down to Harlingen on the Rio Grande turned west up the Rio Grande about 200 miles and back to base, I don't know why. Had two officers along beside the pilots... They were armed with field glasses and were looking for something, I'd guess. Back about 8 p.m. Very tired but I said I'd write so I did. Going straight to bed... will probably dream of you which will add to my rest, because I love you, B.J.